As one of the year’s premier tech events, TechCrunch Disrupt NY continues to attract the industry’s top innovators, startups and developers – this year was no exception. Today, developers can personalize everything from their phones to their keyboards, so why not their headphones? At HARMAN, we continually strive to push the boundaries of innovation in the audio industry, and to help propel this innovation further, we opened up three key products to this ever-growing developer community at the show. As a sponsor of the TechCrunch Disrupt NY 2016 Hackathon, we provided some of these innovators the opportunity to “hack” our JBL EVEREST™ ELITE headphones and our JBL Pulse2 using our open SDKs. At this year’s event, more than 100 developers registered with HARMAN for a chance to win top honors. These developers were among the first to have the opportunity to tap into the powerful audio technology innovations packed into our JBL products. In fact, we opened up the many features included in the JBL EVEREST™ ELITE headphones to developers such as NXTGen Active Noise Cancelling Technology and TruNote™ Auto Sound Calibration for the first time on Saturday. Through the SDKs, the sky was, and now is, the limit for customizing premium headphones for work and play. SleepEZ.space from Peter Ma and Lin Ochoa – With this integration our JBL EVEREST™ ELITE headphones can auto-adjust ambient music volume and color to mitigate background noise while you sleep. An additional integration can identify larger disturbances by monitoring decibel level and when necessary, notify authorities via 311. Augmented Reality from Igor Sinyak – This integration allows the Pulse2 to display a colorized depth map. It uses gestures to speak and these movements can be recognized by Alexa to play music or to control the volume. In addition to developer participation at the Hackathon, we were pleased to see a flurry of traffic at the HARMAN booth during the conference. So far, more than 350 developers, media and HARMAN fans came through to see demos of our developer-ready products and learn more about the endless possibilities our products can now enable beyond audio. 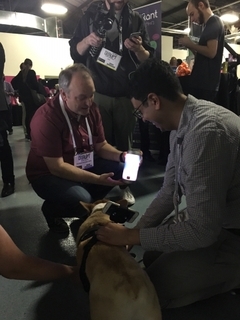 There may also have been a corgi-powered camera among us. Our participation at TechCrunch Disrupt NY was a great opportunity for HARMAN to engage with the developer community in a fun and exciting way. The enthusiasm we saw for our SDKs opened up a whole new world of possibilities for what our products can do with the help and creativity of today’s developers. We’re already looking ahead to what next year’s event will bring and we look forward to seeing you there! 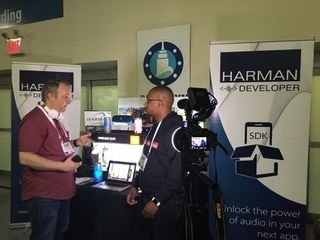 To learn more about how HARMAN is working with developers, or to get your hands on our SDKs, check out www.developer.harman.com.